When the white marble Fifth Avenue Hotel was set to open in 1859, it was mocked as “Eno’s Folly,” after the developer who built it. With the city’s hotel district farther south on Broadway, why would anyone pay to stay on the outskirts of the city’s center, as Fifth Avenue and 23rd Street was at the time? 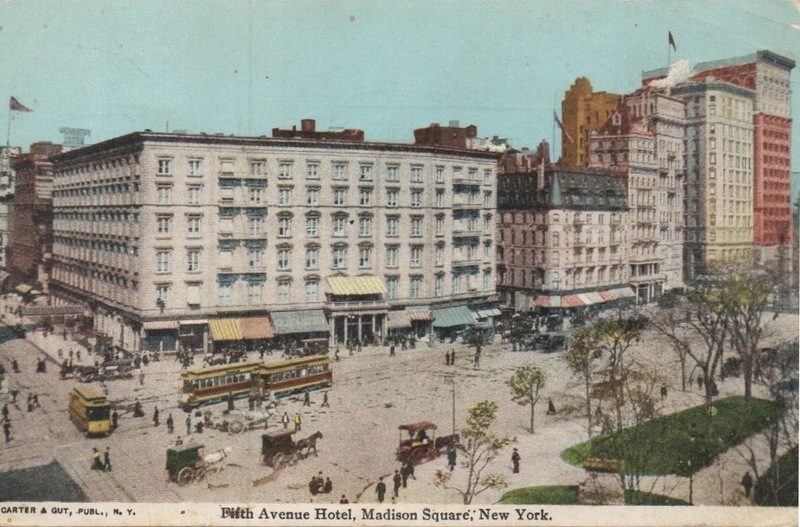 But after its grand opening, the Fifth Avenue Hotel became the city’s premier luxury residence and made Madison Square the focal point of post–Civil War New York. Among the amenities: rooms with private baths and fireplaces and the first “vertical railway”—aka, elevator—ever installed in a hotel. Presidents and kings stayed there, attended to by a staff of 400. The city’s richest men, like Jim Fisk, Jay Gould, and Cornelius Vanderbilt, congregated in the drawing rooms. Local politicians held court. In 1908 it was demolished; its demise serves as a bookend of the Gilded Age. Today the building occupying this spot houses the Italian dining emporium Eataly. This entry was posted on July 27, 2015 at 8:06 am and is filed under Flatiron District, Politics, Sketchy hotels. You can follow any responses to this entry through the RSS 2.0 feed. You can leave a response, or trackback from your own site. In the picture one can see the tall Hoffman Hotel at 25th & Bway, which must also have had an elevator, and which had in it’s first floor all-male bar one of the most sensuous paintings ever made – Nymphs & Satyr – now at the Clark Institute in Ma. One wonders why these guys are at 23rd Street when that painting was only a block away. These were not saints, but literally robber barons. Love your site and the great work you do reminding us of our history. You are the best! Mike G., you are correct! I and two others who feel the way I do about our NY history have made a special trip to Williamstown just to look at “Nymphs and Satyr”. 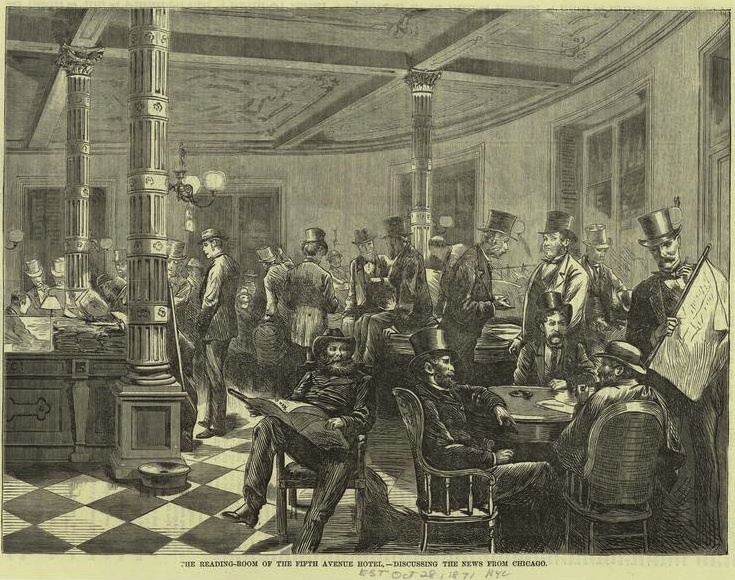 It was easy to imagine the painting on display in the Hoffman House bar and robber barons and their cohorts raucously enjoying themselves….Oh! for time machine!!! I LOVE this site…and the Gilded Age is my most favorite era in New York history and society. Walking in the area, for me, is almost like a visit to the past. Thank you!!! Thank you Trilby! It’s always great reading your comments. You’re welcome, ephem! And thank you for the compliment; I learn so much from ephemeralnewyork and especially love the photos of New York back then. Would you do a piece on the building (now demolished, I’m afraid) on, I think W 25 St., that housed not only the original F.A.O Schwartz toy store but the apartment in which Stanford White’s infamous red velvet swing was installed? Thank you in advance!! Wonderful and haunting, thanks for sending this. Wow! What a powerful, and not in a positive sense, photo! There is the iconic Flatiron Building and the debris that is all that remains of yet another testament to New York’s greatness of the day. Whenever we lose another of our splendid buildings, and some not in any way splendid but historic all the same, it is for many of us a crime of sorts.